Hazel Baker — teacher, legislator, and journalist — was born in Monroe, Utah on June 25, 1887. She was the tenth and last child of Utah pioneer parents, William George Baker and Nicoline Marie Bertelson-Baker. Denton moved to Nevada in 1914 and taught first and second grade in Kimberly, Prince Mine, and Caliente. She married saloon owner and future under-sheriff Floyd Howard Denton on December 28, 1916. The couple had four children together, but she and her husband felt the hardships of pioneer life when their two daughters died as toddlers. Denton’s community outreach began in Prince Mine where she held night classes to teach English to foreign adult miners. In 1921, she became president of the Caliente Homemakers Club and then President of the Caliente Parent-Teachers Association five years later. 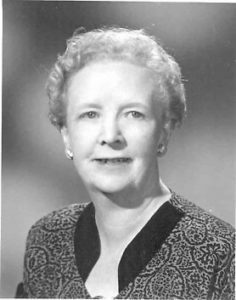 Denton also twice served as president of the Caliente Women’s Club, co-founded the Caliente Business and Professional Women’s Club, and was president of the Nevada Federation of Women’s Clubs (1944-1946). In 1922, Denton was elected to the Lincoln County Board of Education. She resumed teaching in Caliente in 1928 with the unusual distinction of being both a teacher and President of the Board of Education. Denton belonged to several educational organizations, including serving as member and president of the Lincoln County High School Board, Nevada Director of the National Education Association, treasurer of the Nevada State Classroom Teachers Association, and member of the board of the Nevada State Education Association. After forty years in education, Denton retired from teaching in 1952.That same year she ran for and won a seat in the Nevada State Assembly where she was re-elected in 1954. While in the Assembly, Denton introduced several bills and resolutions aimed at improving the status of free public libraries and state parks. Denton also had an unwavering love of writing. She was a local historian and freelance writer, serving as a correspondent for the Nevada State Journal and the Reno Evening Gazette. In 1937, she wrote her first weekly column, “Caliente All the Time.” Her next column was “While the Toast Burns,” which she wrote from 1948 to 1953. Both appeared in several local newspapers in southern Nevada. Denton’s poems and prose were compiled in her book, Ironing Days, published in 1955. Denton died in Las Vegas in 1962. Hazel Denton papers. Nevada Women’s Archive. Special Collections, UNLV. Collection number 97-03. Photo courtesy of UNLV Special Collections. May not be reproduced without special permission of UNLV Special Collections.